Bada Bing – Washington, DC – What’s a spiedie? (@badabingdc) – Food Truck Talk – Searching for the best foodtrucks! 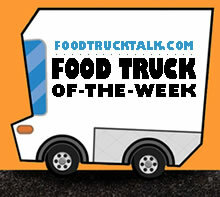 Congratulations to Bada Bing as FoodTruckTalk.com’s Food Truck Of-The-Week! It’s always nice to learn something new. 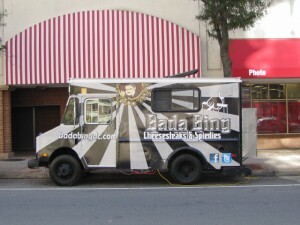 Recently I learnt what spiedies (pronounced “speedies”) are, courtesy of Washington, DC and Northern Virginia’s Bada Bing food truck. Spiedies originated in Central New York State in the 1920’s. Two Italian immigrants started the spiedie craze when they took cubes of chicken, pork, lamb, veal, venison or beef and marinated them overnight (or longer) in a special marinate before grilling then on spits over a charcoal pit. The earliest recipes for the special marinade included wine vinegar, water, lemon juice, garlic, mint. Italian spices, olive oil and minced onion. Bada Bing chef and owner Nick Terzella would gladly tell you his secret marinade recipe. But, he would then have to kill you! (Sorry, couldn’t resist). Spiedies from Bada Bing are made from either chicken or pork and served on Amoroso rolls or over greens as a salad. A variety of spiedie sandwiches are available including the namesake “The Bing” with fresh mozzarella, tomatoes and basil aioli, “The Don Ho” with soy ginger glaze, shredded carrots, green onion and crunchy noodles, and “Joey’s Special” with a bbq glaze, sharp cheddar, bacon and lettuce. “Kendall’s Favorite” is also a crowd pleaser as it features a “buffalo bing” sauce, tomato, lettuce and crumbled bleu cheese. 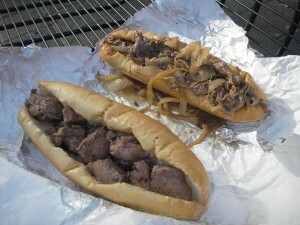 In addition to spiedies Bada Bing also offers a heck of a Philly Cheesesteak sandwich. Provolone, American, and Cheese Wiz cheeses are available, as are grilled onions. When ordering remember to specifiy your cheese selection as well as if you would like your sandwich “wit” or “witout” onions! Try to sound like Sylvestor Stallone in Rocky when ordering! The Amoroso rolls that Bada Bing uses (for their cheesesteaks and spiedies) are the same rolls that the best cheesesteaks joints in Philly use. Some say the sandwich just isn’t the same unless the rolls come from the Amoroso bakery! A variety of freshly prepered side dishes and soups are also available.